Last January, Just above the city of Emmett Idaho, at a pull out on Highway 16. I bought this bike a few months earlier and it was in real bad shape. Tore it all down and went through most of the systems. I have a couple more nits to take care of before riding begins again this spring. Thanks for looking. Wow! Bodywork is looking great! Dittos to Tony. I was not there but can only imagine half of the effort it took to put this shin-dig on. Despite not attending - we all benefit from the generosity of Tony and others on this forum. Thank you. Thanks for posting up pics. Wish I was there. Ride safe. Cheers! All packed up and Bluebird is ready to fly. Leaving Sunday am. First night West Yellowstone. Then will meet some of you in Sheridan on Monday in time for dinner. Cheers! I know what you mean. I'm just making a point to get riding multiple long day trips as a way to tune up the body.... Cheers! Axel, thanks for all the planning. It looks like a great route. As noted Kooskia is a great spot for me to link up with you guys. I'll go ahead and book rooms as suggested. Looking forward to this. Didit, I'll look for the registration and get that taken care of. Thanks to you both! Cheers! Pics of my RWB on first ride after full mechanical refresh. Hmmm... Orofino.. 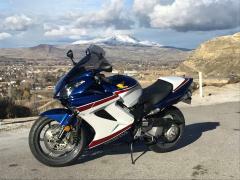 I may ride up from Boise and meet up for the ride across Hwy 12. I'll stay tuned. Booked #32 this morning. Dates look good so far and looking forward to meeting folks.